ARCHAEOLOGISTS working on two important Inishowen sites will present their findings tonight in Carndonagh. The archaeologists from Ireland and the UK including Newcastle University, have in recent weeks carried out a dig at Cooley Graveyard in Moville and a geophysical survey at Donagh Cross in Carndonagh. They promise to provide an "up-to-the-minute" report on their findings at these early Christian sites when they gather tonight at Carndonagh Library. The event concludes a successful week-long Lands of Eogain Festival in which the group delivered a range of fascinating Celtic and early-Christian themed talks and seminars including details about the early stone crosses of Donegal; early pilgrimages to Iona and the early Christian sites of Inishowen. 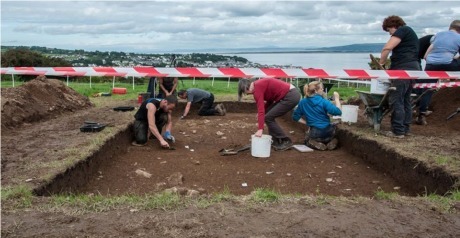 The dig at the early-Christian graveyard overlooking Lough Foyle at Cooley, Moville, including members of the Bernician Studies Group and archaeology students from Newcastle University. Lands of Eogain aims to collaborate with local and international heritage groups "to raise awareness of the significance of Inishowen in a European historical context and for its intrinsic and economic value to our communities".They hope to deliver in the future "high-quality projects in the fields of natural and cultural heritage on Inishowen, to promote sustainable destination tourism and stimulate a community sense of guardianship of our historic sites". The 'Latest Discoveries at Carndonagh and Cooley' talk will be hosted by Lands of Eogain and delivered by Colm O'Brien and Max Adams of the Bernician Studies Group. It will take place at Carndonagh Library, this evening, Thursday, August 25, 2016 at 7pm and everyone is welcome.